Sembawang White Beehoon 白米粉 will need no introduction among foodies in the north. This eatery is very popular and there will be long queues formed during meal times especially during the weekends. 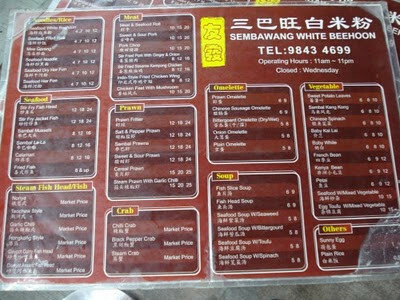 The Sembawang White Beehoon 白米粉 is located at You Huak Restaurant along Jalan Tampang, opposite Sembawang Shopping Centre. Its signature dish is as its name suggest is White Beehoon. We were quite lucky as we arrived at around 715pm on a Thursday night for our dinner. Why lucky? Well, there was no queue and several empty tables. After we sat down for about 15 minutes, the crowd arrived and a queue started forming outside. For close up of the menu, you can refer to my first post. The Sambal Chilli was great! Very spicy, fragrant with belacan flavour. Very addictive and goes well with the White Bee Hoon. The Meat and Seafood Roll (Ngoh Hiang) also known as Prawn Roll which was recommended by many online.. was well just average. Taste normal and I am sure you can find this standard of Ngor Hiang at many other eateries. Another dish which I always order is the Bittergourd Omelette (wet version). The bittergourds were sliced thinly and simmered till soft. The eggs were cooked quickly such that they were still soft. A very simple nice dish that suits me particularly well as I like bittergourd. The Sambal La La sauce was slightly spicy. It was quite well fried, each piece of lala was well coated with the sambal sauce. Nothing special, average dish. Baby Kai Lan fried in oyster sauce with slices of carrot and mushroom. An average dish; tasty and crunchy vegetables. Drinks are charged separately as they are different entities. The dish that is a must order at Sembawang White Beehoon is of course the Seafood White Beehoon. The other dish worth ordering is the Bittergourd Omelette and Stir Fry Fish Head. I can't help but emphasis that the Seafood White Beehoon is similar to a home-cook dish; simple and heart warming. In terms of prices, its not expensive too. Worth coming down for a try as it is hard to find such quality food at such prices now. Now, I find it harder to patronise the eatery. Main reason is because of the ridiculously long queues. 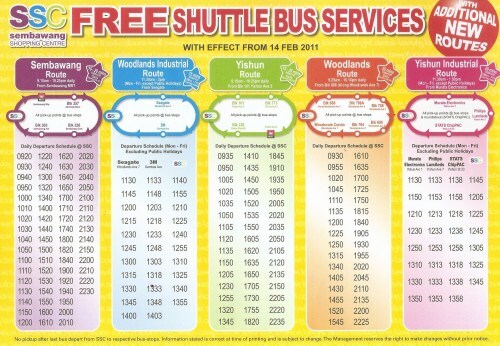 There is free shuttle bus service to Sembawang Shopping Centre extending into the Sembawang, Yishun and Woodlands residential areas. The bus frequency is quite fast and operating hours are stated in the flyer above. Hey, I've been there too & really like it! I was introduced to this place only this year by my son. Imagine I've been living in the North for more than 10yrs. Lol! Lovely food and am drooling over each one of it and please hand over the spicy chili dipping sauce. Gosh, my saliva dripping now after looking at the pic. They should start selling the sauce! Typing this post made me want to eat it again... so much so that i think I am going down to eat it tmr! Its a cycle. Eat, post, get graving, eat...cycle goes on and on lol.